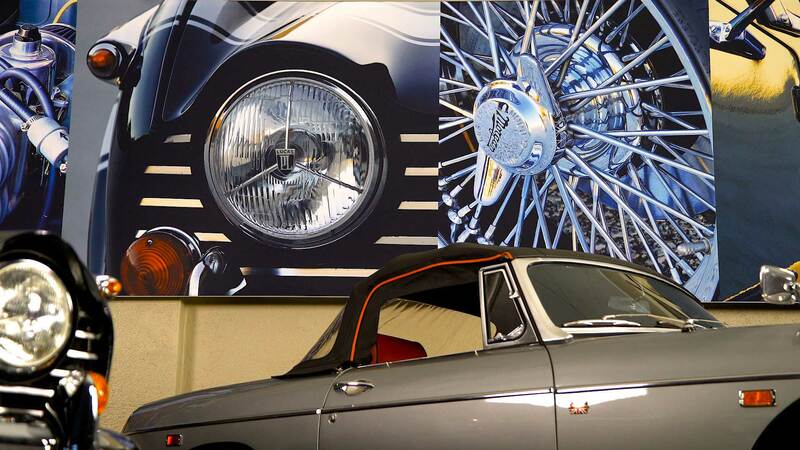 With graphic displays in sizes up to 10' x 40' and brushed aluminum prints up to 27" x 57", Garage Graphics® will help you express your automotive passion – and transform your space. From conveniently packaged UPS or FedEx ground shipping to complete installation instructions and simple assembly, Garage Graphics makes it easy to think big. With state-of-the-art dye-sublimation printing, fire resistant fabrics, ADA-compliant frames, and low-voltage, UL-approved LED lighting, it's all about... everything. Ron Nelson picked up his first camera—a 35mm with a telephoto lens—in 1956. That weekend, on leave from the U.S. Coast Guard he traveled to Road America in Elkhart Lake, Wisconsin to see the second race ever held at the (then) new track and begin his long and storied time behind the lens. If you like historic racing photography, Ron’s galleries are filled with simply fabulous shots of 60s and 70s racing—Gurney, Clark, Moss, Foyt, they’re all there. Garage Graphics has transformed my garage into a very special space where my friends and I hang out for hours and enjoy our car hobby. The sheer size and the presence of those beautiful images just make the place. The installation was simple and done in a couple of hours, which is amazing for that size of images. I am more than 100% happy and would highly recommend it to any car enthusiast. It’s the next best thing to actually owning my classics. Just love it…. The garage is a place that takes me away from the pressures of work and allows me to enjoy my passion of old cars. The large photo graphics that Garage Graphics produce transformed the workshop into a second living room. I am very pleased with the look and overall quality of the Garage Graphics in my shop (flatironsautohaus.com). Doug and his staff took very good care of me and my project. The final result is truly fantastic! The brushed aluminum print of my Austin-Healey 100M just arrived and its out of the box. ITS SPECTACULAR. I just stare at it. After selling the Healey last November, Susan and I wondered for many months about how to memorialize our years with "Lola" We considered models and photographs and all manner of things but couldn't decide... We have attended Automobilia for many years and spend Monterey Car Week with my family in Carmel. Meeting you and Doug was heaven sent. In the first ten seconds Susan and I knew we had found our "Lola" remembrance. The 24 Du Mans is and always will be my favorite and, the worlds most significant motor race and you have given us a forever connection to both "Lola" and "The 24 Hueres ". Thank you ever-so-much.